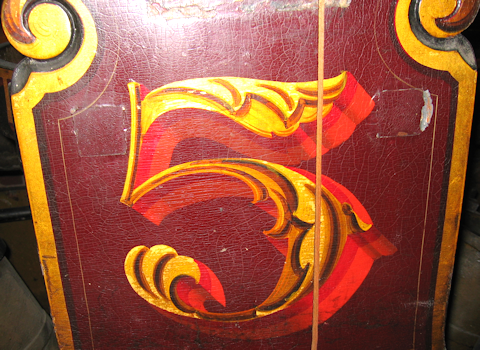 Parades and musters displayed fire engines up close, showing impressive mechanics and beautiful ornamentation. City fires drew huge crowds to see the apparatus in action. 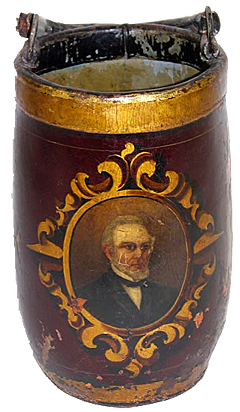 In the early 1800's each volunteer hand engine company was independent and each engine looked unique. 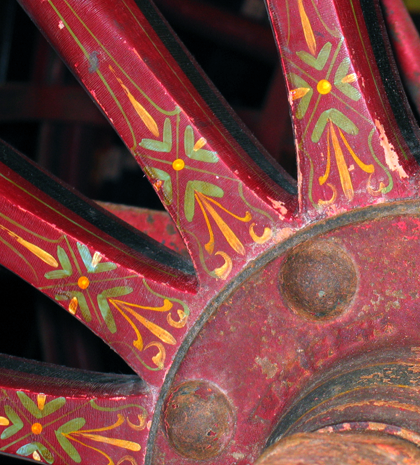 An engine could be identified from afar by its coloring and decoration. 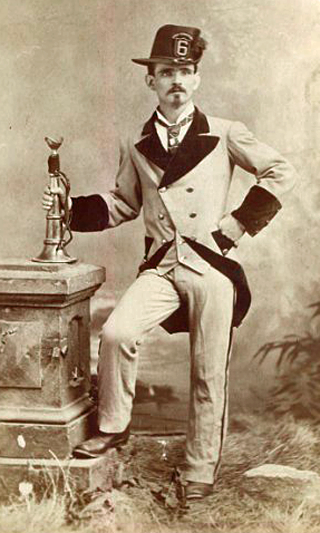 In the late 1700's and early 1800's archaeologists were making discoveries in the ancient world. The public was fascinated with the excavations going on in Rome, Pompeii, Greece and Egypt. 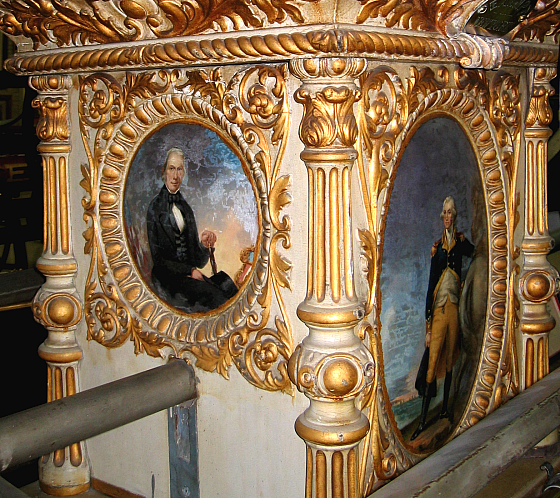 The ornaments and styles being uncovered in Rome influenced the painted decoration on chairs used by president Washington. Thomas Jefferson designed with this same early classical language in the architecture of Monticello. 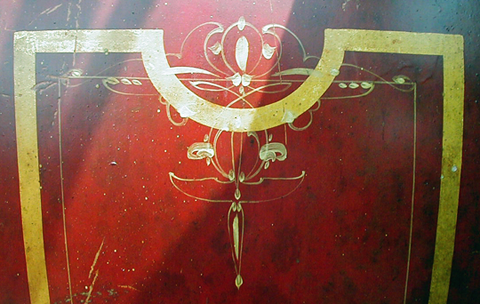 These same symbols and motifs appeared on early fire engines. The ancient classical language was rewritten by American builders and crafts people. Lady Liberty and George Washington joined the gods on Olymmpus. "Your own property is concerned when your neighbor's house is on fire." Americans identified themselves with the free citizens of ancient Greece and Rome. 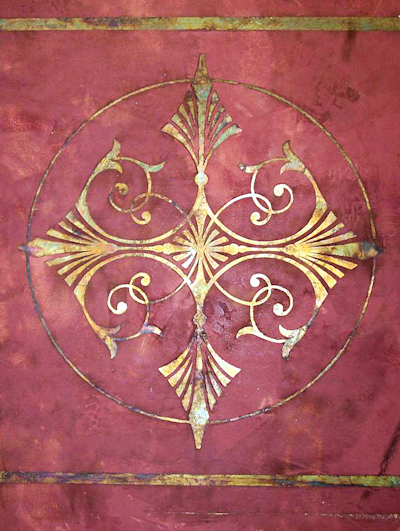 They constructed their new buildings, furniture and vehicles with the symbols and designs of Greco-Roman culture. The humble colonial cape house was reconfigured to become a little Greek temple. The front door got moved to the gable end. 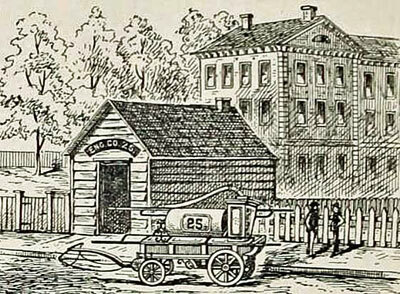 Early fire engine houses were small out buildings that often had this appearance. Each hand engine company was a neighborhood institution. 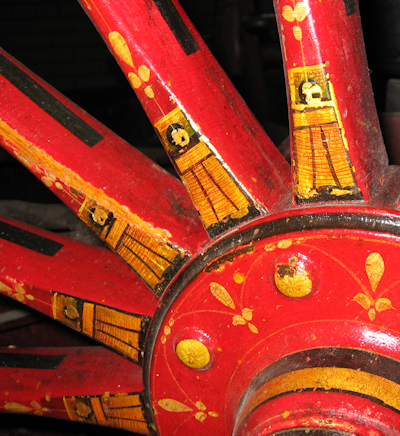 Local symbols appeared on the engines, such as a landmark or celebrity or event connected with that place. 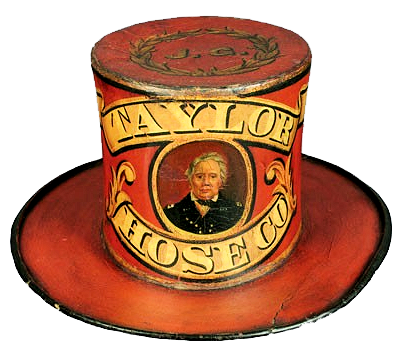 The firemen debated and voted on an engine's name, color, motto, etc. People felt an emotional and spiritual connection to the engines. There were people that had been saved by a fire company. There was comradery among the firemen of a company and also connections with the citizens. These feelings grew with each heroic act or tragedy. The fire engines were witnesses to these charged events. Each engine held its stories which touched the neighbors deeply. The ornament displayed local symbols that conveyed universal subjects of life and death, fire and water, freedom and duty... large topics taken on by average citizens. 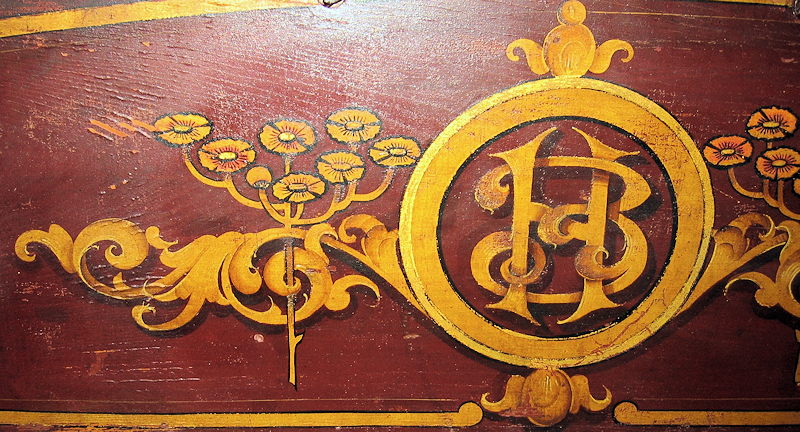 Early 19th century fire engine decoration resembles the coach painting style of that day. 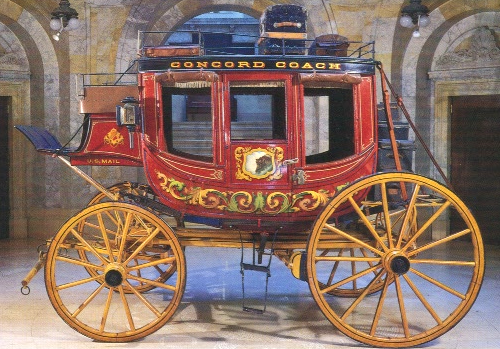 Public coaches were the main mode of overland transport between towns. The coaches were painted in bold colors with eye catching decoration. The hand engine builders took that look and refined it. 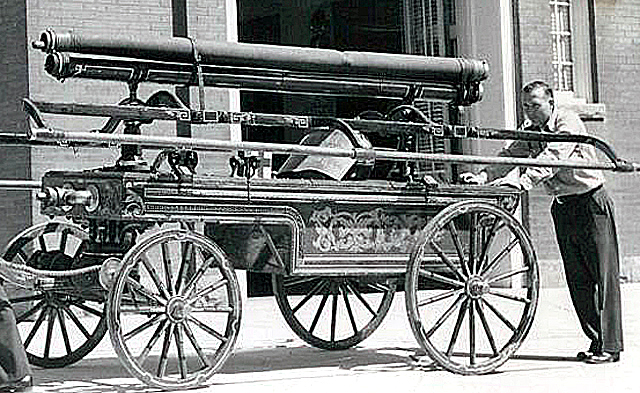 Steam fire engines were one of the few large heavy vehicles that needed to go fast. 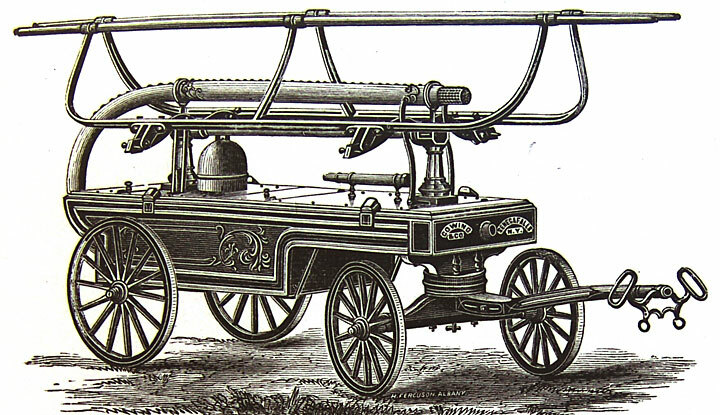 The limits of new technology were often tested first by fire engine manufacturers. One job of the ornamenter was to make the engine look lighter. 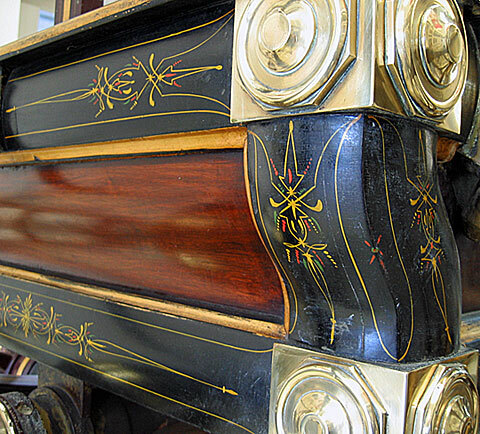 A steam fire engine without stripes looks more massive than the same engine veiled in gold stripes. This is especially true of the large wooden wheels. 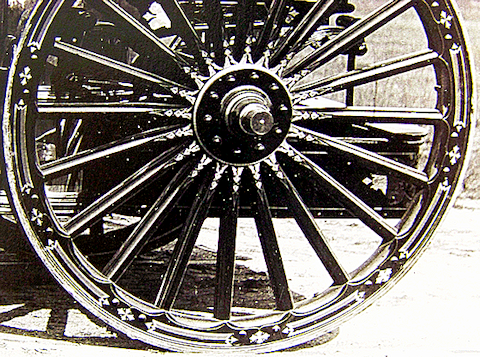 Every spoke has multiple stripes on the front and sides. Complimenting colors and reflective gold break the surface up. The large pieces are visually broken into smaller parts. 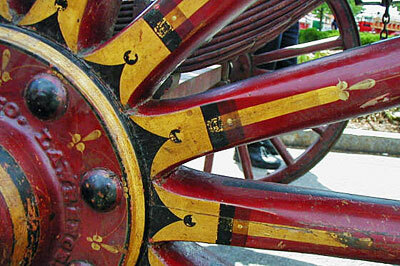 Gold was used on nearly all fire engines built after 1810. Gold was as elemental as the fire and water that the engine was built to control. At a fire the gold leaf reflected the flames and "the engine seemed alive". In a parade the gold would flash in the sunlight as the engines went by. Gold also reflected the dark of the night. When designing with gold, one must imagine it as some times black and at other times brighter than white. 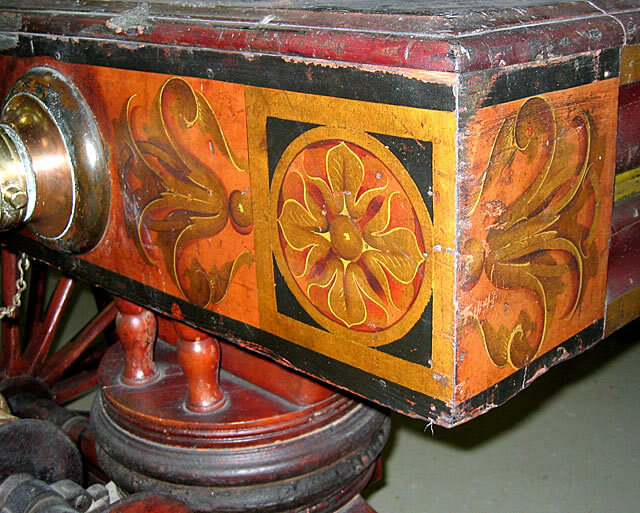 The first decades of hand engine decoration set a standard that lasts to today. 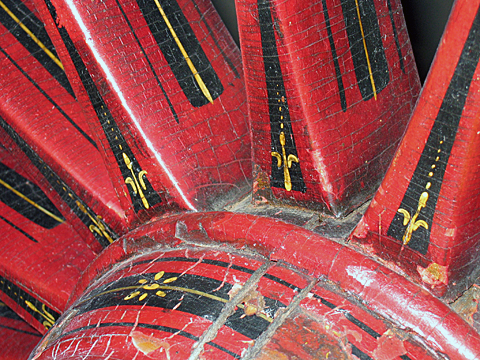 Bright colors, gold stripes and heavy Renaissance scrolls remained while popular fashion changed over the years.